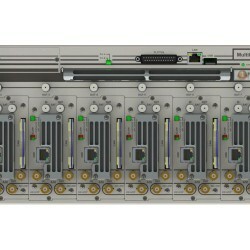 MultiTastic is an innovative multi-channel transmitter which introduces the “Cast-sharing” concept. 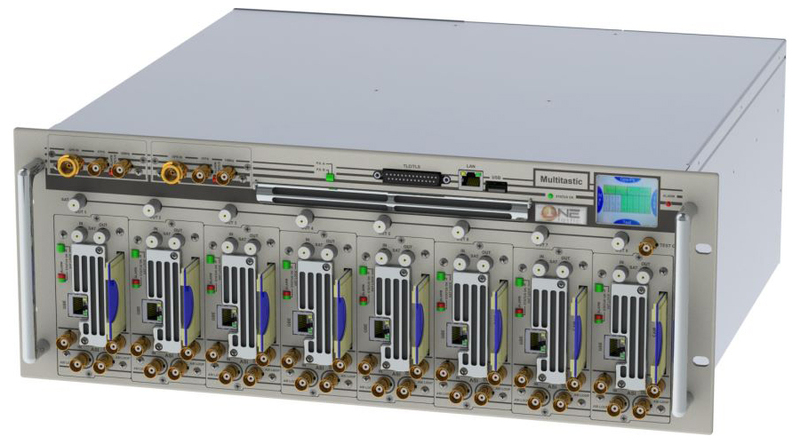 In today’s broadcast ecosystem and scenario, main broadcasters, network operators or even municipalities operate not only one but several DTV channels. But when it comes to investment in network infrastructure (CAPEX) or future operation of such network (OPEX), the bill can become quite expensive, and the investment almost impossible to overcome when high DTV penetration is required. In a single 4U 19” Rack, MultiTastic combines up to 7+1 (or 6+2) transmitter modules (DVB-T/H/T2, ISDB-Tb, ATSC, DAB/DAB+/T-DMB), each of them equipped with various input interfaces (Satellite Receiver, ASI, ETI, EDI, Gigabit Ethernet or RF). A clever system of internal matrix has been implemented, so a spare transmitter module automatically takes the lead in case one fails, ensuring a full redundancy management to the system. RF amplification system can be independent per each transmitter or also common, with redundant final amplifier (Multitastic C2) in case of adjacent channels. 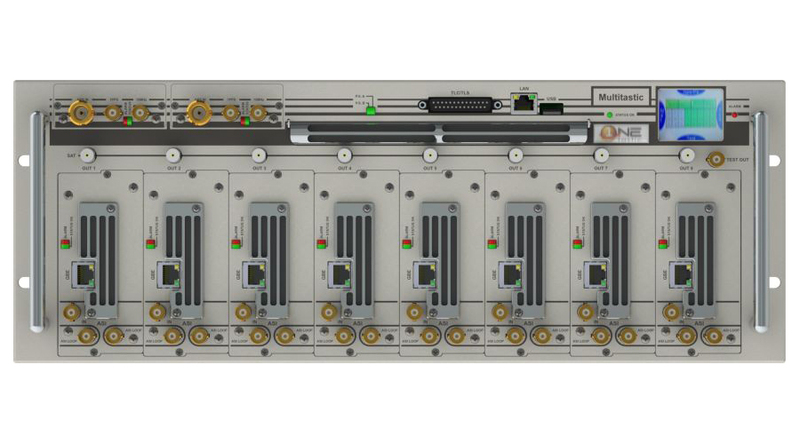 Embedded Satellite multi-switch, dual redundant hot swappable GPS / GLONASS receivers and power supplies secure the system operation in any situation. Instead of investing into several separate transmitter units, as well as complex and costly redundancy management systems, broadcasters or network operators can now simply invest into a single 4U 19” rack MultiTastic transmitter and operate up to 7 channels in one compact box… Here is Cast-Sharing! 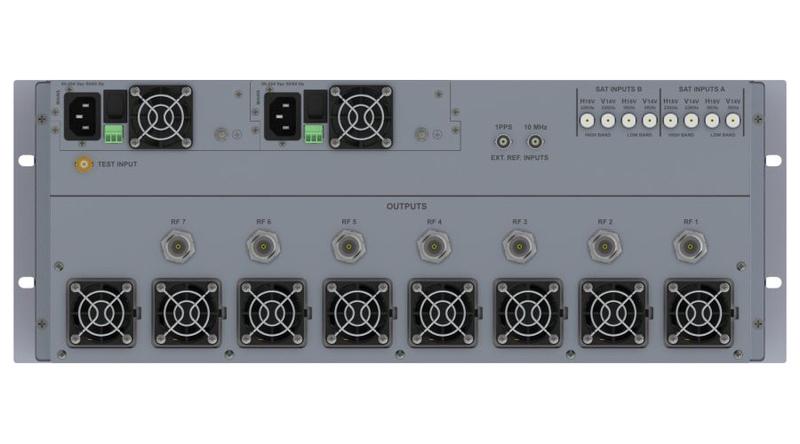 ASI BNC (f), 75 Ohm and RJ45 TS oIP 10/100/1000. 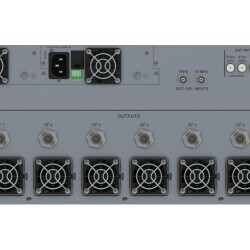 ASI TS/BTS BNC (f), 75 Ohm and RJ45 TS/BTS oIP 10/100/1000. Automatic, all modalities available according to the standard. 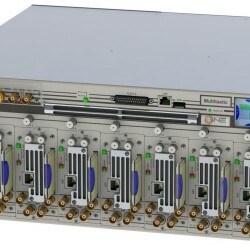 also for maintaining the required shoulder distance), the transmitter may only be operated with suitable filters at the RF output. 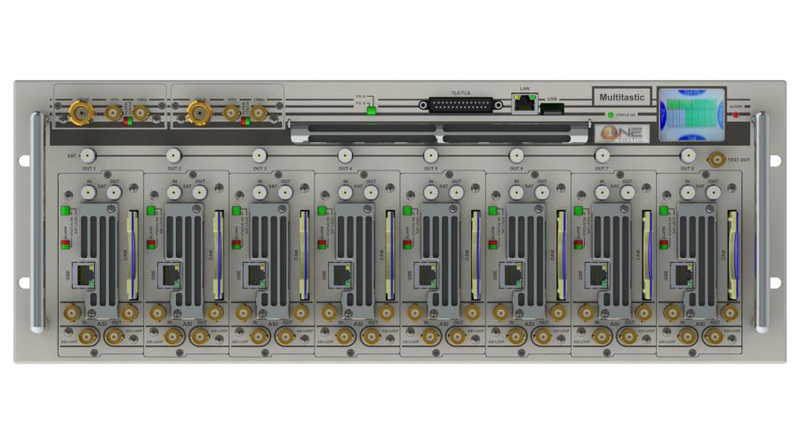 Base chassis, 4RU, 8 slots, to be fitted with Multitastic plug-in transmitters for N+1 or N+2 configurations, including 1 power supply, 1 GPS / GLONASS receiver and RF output matrix. To receive support please fill in the following form. Our staff will promptly replay. Onetastic S.r.l. is committed to safeguarding the information Users entrust to Onetastic S.r.l. and believes every User should know how Onetastic S.r.l. utilizes the information collected from the Web Site(s) onetastic.com, onetastic.net, onetastic.it, onetastic.eu and broadcasting.digital. The Web Site(s) is/are directed towards people who must be of age to make a purchase. Onetastic S.r.l. is the sole owner of the information collected on its site(s). Onetastic S.r.l. will not sell, share, or rent this information to others in ways different from what is disclosed in this statement and from what is required by Italian and international laws. Onetastic S.r.l. collects personally identifiable information from Users in a variety of ways, including through online contact forms and online forms for ordering products and/or services, and other instances where Users are invited to volunteer such information. Onetastic S.r.l. may also collect information about how Users use its Web Site(s), for example, by tracking the number of unique views received by the pages of its site(s), or the domains from which Users originate. Onetastic S.r.l. may use "cookies" to track how Users use its Web Site(s). A cookie is a piece of software that a Web server can store on the Users' PC and use to identify the Users should they visit the Web Site(s) again. While not all of the information that Onetastic S.r.l. collects from Users is personally identifiable, it may be associated with personally identifiable information that Users provide Onetastic S.r.l. through its Web Site(s). Onetastic S.r.l. currently does not use third party ad networks to serve ads and/or other services on its Web Site(s) but reserves the right to use them in the future. In such case Users will be promptly noticed about in this statement and/or by e-mail. Onetastic S.r.l. uses personally identifiable information collected through its Web Site(s) to permit proper invoicing of the goods to be shipped and for any requirements governed by italian and international laws. Onetastic S.r.l. may use personally identifiable information collected through its Web Site(s) to contact Users regarding products and services offered by Onetastic S.r.l. and its trusted affiliates, independent contractors and business partners, and otherwise to enhance Users' experience with Onetastic S.r.l. and such affiliates, independent contractors and business partners. Onetastic S.r.l. may also use information collected through its Web Site(s) for research regarding the effectiveness of the Web Site(s) and the marketing, advertising and sales efforts of Onetastic S.r.l., its trusted affiliates, independent contractors and business partners. Onetastic S.r.l. may disclose information collected from Users to trusted affiliates, independent contractors and business partners who will use the information for the purposes outlined above. Onetastic S.r.l. may also disclose aggregate, anonymous data based on information collected from Users to investors and potential partners. Finally, Onetastic S.r.l. may transfer information collected from Users in connection with a sale of Onetastic S.r.l. 's business. If personally identifiable information changes (such as an e-mail address), the User can write to Onetastic S.r.l., Via Ghislandi, 47 - 25125 Brescia (BS) - Italy or send an e-mail to privacy@onetastic.com with the update information or request. Onetastic S.r.l. online forms request the amount of information need to process Users orders and/or requests of estimates/quotes. The User must provide contact information (first and last name, company, address, city, zip code, province/state, country and e-mail address). This information is used for billing purposes and to fill Users' orders and/or requests of estimates/quotes. In the event there is a problem processing an order or a request of estimates/quotes, this information will be used to contact Users. Onetastic S.r.l. reserves the right to occasionally send registered Users information on products, services, and special deals. Out of respect for a User privacy, people who wish not to receive these types of communications can send an e-mail to privacy@onetastic.com. Onetastic S.r.l. 's Web Site(s) make(s) use of standard log files which are not linked in any way to Users' personal information. Onetastic S.r.l. 's Web Site(s) records Users' IP addresses to analyze trends, administer the site(s), track User's movement, and gather information for aggregate use. IP addresses are also not linked to personally identifiable information. Onetastic S.r.l. only shares aggregated statistics with partners and advertisers. This information can not identify any individual person. Onetastic S.r.l. has standard security measures in place to protect the loss and misuse of sensitive information. onetastic.com, onetastic.it and onetastic.eu may contain links to other sites. Onetastic S.r.l. is not responsible for the privacy practices of such other sites. Onetastic S.r.l. encourage Users to be aware when they leave its Web Site(s) and to read the privacy statements of each and every web site that collects personally identifiable information. This privacy statement applies solely to information collected by onetastic.com, onetastic.it and onetastic.eu Web Site(s). onetastic.com, onetastic.it and onetastic.eu Web Site(s) have security measures in place to protect the loss, misuse and alteration of the information under Onetastic S.r.l. control. Onetastic S.r.l. 's hosting server has strict security in place to prevent an intruder from retrieving personal information about its Users. Onetastic S.r.l. 's hosting server staff check server access daily to ensure the above holds true. Onetastic S.r.l. also do everything in its power to protect User's information off-line. All of a User information is restricted in Onetastic S.r.l. 's offices. Only employees who need information to perform a specific job (for example, the billing department) are granted access to personally identifiable information. Furthermore, all employees are kept up-to-date on Onetastic S.r.l.' security and privacy practices. If Users have any questions about the security at Onetastic S.r.l. 's Web Site(s), they can write to Onetastic S.r.l., Via Ghislandi, 47 - 25125 Brescia (BS) - Italy or send an e-mail to privacy@onetastic.com. or send an e-mail to privacy@onetastic.com. Subscribe to our free mailing list and stay updated on the activities of Onetastic. © 2011-2018 Onetastic S.r.l. - V.A.T. : IT 03246280980 - Via G. Di Vittorio, 17 - 25125 Brescia (BS) - Italy - R.E.A. : BS 517759 - Social Capital € 100.000,00 i.v.